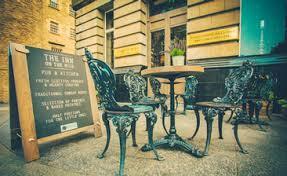 On the corner of North Bridge and the Royal Mile, you’re not likely to miss finding this Pub with its outdoor tables. Formerly the Bank Hotel, it’s had a makeover to create a brash, bold new Bar-Bistro, with nine deluxe bedrooms upstairs. The decor blends traditional architectural features with modern urban style. Designer Jim Hamilton decided to open up the space exposing bare brickwork, wood and metal girders for an industrial look. 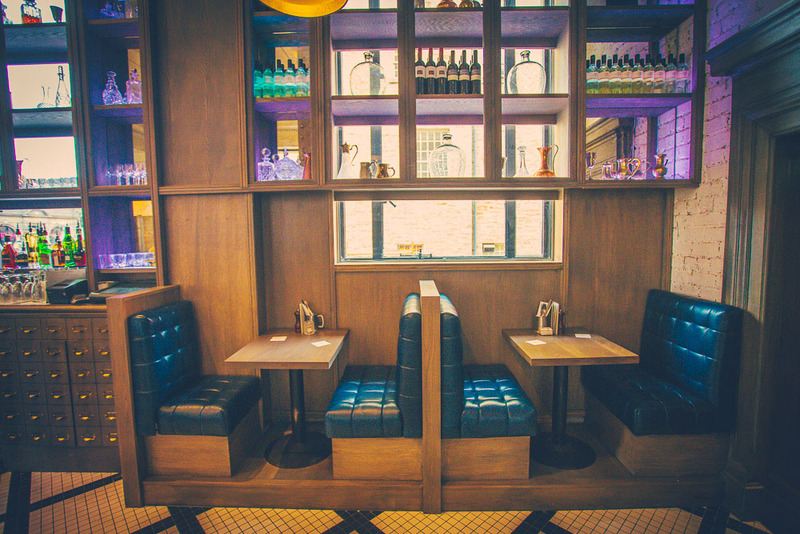 Couchettes and cosy booths offer comfy seating to relax over speciality craft and cask beers, whiskies, wines alongside hearty gastropub food. The cool and contemporary Inn on the Mile is the perfect new name for this Pub with Rooms. 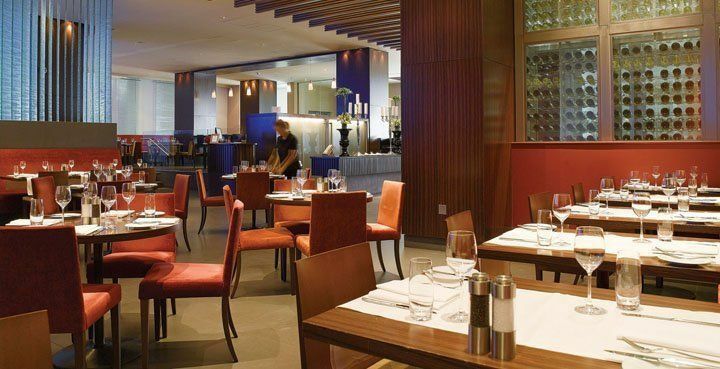 This is the latest addition to the collection of restaurants and hotels in the G1 group (including Murrayfield House, Grassmarket Hotel in Edinburgh, as well as Glasgow and Aberdeen). Upstairs to the bedrooms, each floor is decorated with Timorous Beasties’ iconic, handprinted wallpaper of buzzing bees and colourful thistles. Rooms are designed with individual flair, gorgeous roll top baths or power showers, luxury White Company toiletries and artistic touches. Homely essentials – tea/coffee, bar drinks, hair straighteners, Wifi, Sky TV. So now down to the Bistro Bar for supper. We sat at a large booth with polished copper table top, and on this early evening the mood is warm and welcoming, busy and buzzing with locals and city visitors. The Bar specialises in Scottish craft beers, whiskies and an ingenious selection of cockt-ales – where beer replaces the spirit in fruity alcoholic concoctions. Not sure what to order from the extensive drinks list, I chose a Beer Flight – three small glasses from a choice of six. I tasted Flying Scotsman, Bitter and Twisted and Schiehallion, all labelled and served on a wooden tray. What fun was this! No. 1, dark rich, hoppy, No. 2, sharp bitter at first with sweet aftertaste, No. 3, oaty, light, refreshing. Ken selected an Innis & Gun Rum beer which was the colour of raspberries with a very distinctive flavour. The food menu features everyone’s favourites – fish and chips, haggis (veggie haggis too) Caesar salad, burgers, steak pie, macaroni cheese, rump steak., soup and paninis. I selected 2 very fishy, softly cooked Smoked Haddock fishcakes served on a wooden board, with extra portion of fat chips. Ken very much enjoyed his Fish Supper, traditionally served in newspaper on a plate, so that you could eat with fingers or knife and fork. Two generous portions of quality homely food, both simply delicious. No room for pudding, but those with a sweet tooth could choose apple pie, ice cream or fudge cake. 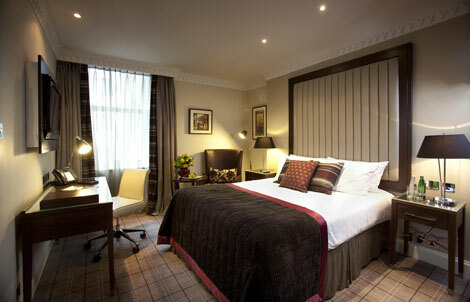 “Great location to stay for exploring Edinburgh. 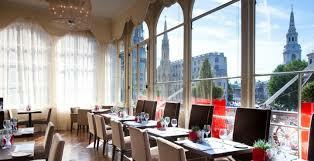 Will definitely be returning to The Inn On The Mile”. 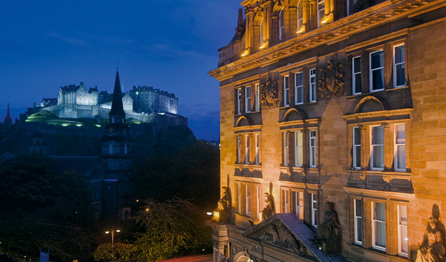 There are several reasons why a visit to Edinburgh should be on your bucket list in the near future. At the recent World Travel Awards, from a short list of major cities including Venice, Florence, Paris and London, Scotland’s capital was named Europe’s leading destination. Where to stay? The new look, revamped Caledonian hotel, a long time favourite of James Bond (aka Sean Connery), is now part of the world class, 5 star Hilton Waldorf-Astoria collection. 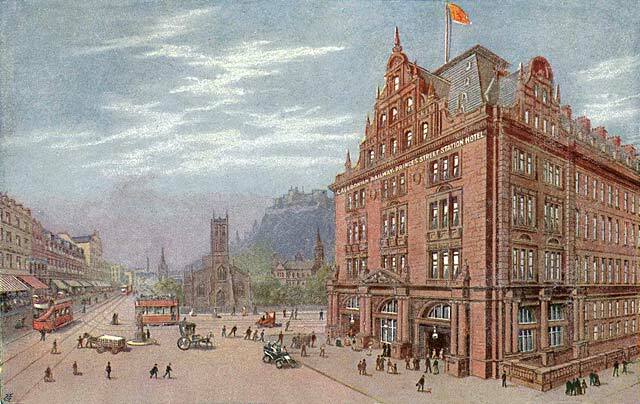 Known locally as The Caley, the hotel has been a turreted redstone landmark at the West End of Princes Street since 1903, designed as a Grand Hotel to cater for increased tourism thanks to the Steam Railway. The Caledonian Railway company was established in 1845, first linking Carlisle to Glasgow and Edinburgh, then within three years providing the first through service from Scotland to London. This was a major achievement, as until then travellers would have to take a ship from Glasgow to Liverpool, then onwards by train to London. Now with the opening of the cross border mainline, passengers would be able to leave Edinburgh in the morning and dine in London the same day. The Edinburgh terminus, Princes Street station was gradually developed during the 1890s to create a network of seven platforms handling 250 trains a day. Before the era of car or air travel, journeys by train ruled supreme across Britain. Tourism in Scotland was proving very popular thanks to Queen Victoria, for wild landscape, golf, shooting and fishing. The newly completed Forth Rail Bridge would soon allow train travel to the Highlands. The directors of the Caledonian company were astute businessmen who were not content in just running a railway. They believed that once they had ‘the traveller in their pocket’ then they should aim to keep and look after visitors at the end of the journey. With this vision, several city-centre railway hotels were planned for Aberdeen, Inverness, Glasgow and most importantly Edinburgh. This was major investment requiring serious finance but finally the doors opened on the magnificent, pink Permian sandstone Caledonian Hotel in December 1903. Built above and around the station concourse overlooking Edinburgh Castle, with 205 bedrooms, restaurants and ballroom, this marble-pillared Palace offered a taste of opulence from décor to hospitality. The hotel’s Telegraphic address was simply “Luxury Edinburgh”. Dressed in gold brocade, the ornately painted Pompadour Restaurant (named after Louis XV’s mistress) opened in 1925, soon established as the most fashionable hotspot in town for dinner dances and haute cuisine. Throughout the 20th century, The Caley welcomed visiting stars of stage and screen: Charlie Chaplin, Bing Crosby, Gene Kelly, Elizabeth Taylor and Sean Connery; from Edinburgh Festival performers to members of Royal Families across the world. In 1965 it was the end of an era with the closure of Princes Street Station after nearly a century. But this gave the opportunity to expand the hotel with a new wing of bedrooms built over former platforms. Hilton took over the management of the Caley in 2000, ensuring a fresh modern start in time for the centenary. 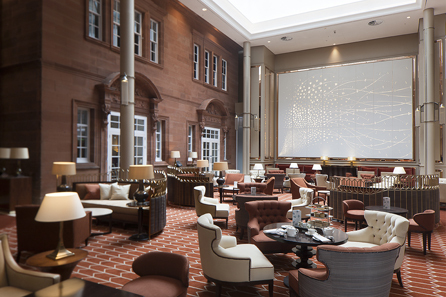 Fast forward to Autumn 2012: the Caledonian is reborn once again after a £ 24 million restoration and glamorous design facelift. Now within the Waldorf Astoria brand, the Caledonian joins the elite collection of elegant hotels from New York to Paris. Welcomed by the doorman in tartan trews and top hat, enter the reception lobby with its crystal and amber chandelier, then through to the hallway with the sweeping transatlantic liner–style staircase. The Art Deco heritage has been re-created with polished bronze, gold leaf, crafted rosewood with quirky Scottish motifs, thistle wallpaper and soft plaid tweed. What is simply fabulous is the artistic theme of travel which embraces the life and times of the old Railway Hotel with the nostalgic ambience of the 1920s/1930s. The old station clock now hangs in a magnificent, glass-roofed Atrium, Peacock Alley, the place to sit and be seen for morning coffee, Afternoon tea, champagne and cocktails. And of course, classic Waldorf Salad is included on the food menu. It was devised in 1896 by Oscar Tschirky, the Maitre d’ at the New York Waldorf, and celebrated by Cole Porter in his love song, You’re the Top. The 241 bedrooms and lavish suites are imaginatively designed for supreme comfort and style: WA monogrammed linen, vintage photographs of train stations, faux crocodile-skin “luggage-trunk” cabinets, Ferragamo toiletries in spacious bathrooms. 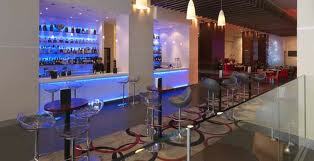 Bars and Restaurants follow the enhancement to create a classy, refined lifestyle throughout the hotel. The Caley Bar has booths and armchairs to encourage a leisurely drink – a cool Martini or speciality 1903 cocktail (whisky, honey, orange twist) with popcorn and tortilla snacks on the side. 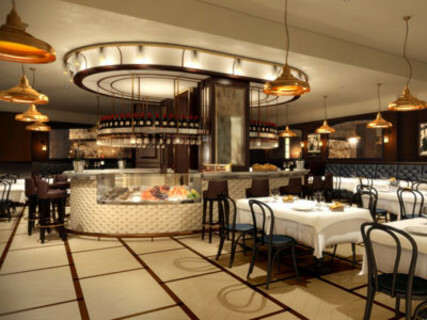 Dining at the Caledonian is now under the culinary care of the Galvin Brothers who run the Michelin-starred Windows at the London Hilton. Upstairs on the Entresol floor the Pompadour, decorated with flowers and exotic birds, is a sumptuous Parisian Belle Epoque-style restaurant. First an aperitif in the intimate salon next door as you study the gourmet French menus, such as Ravioli of Rabbit, Seared fillet of Angus Beef, Poached Turbot, Tarte Tatin. Scottish seafood, beef and lamb are complemented with speciality produce from France. I sampled a salad appetiser of tender slices of scallops, potatoes and artichoke, shaped like a flower on the plate, Roast Lobster, (from Scrabster, Caithness), stuffed with tiny sweet girolles, and a platter of French and Scottish cheese. This was a gastronomic experience and I can’t wait to return. Friends of mine have visited several times in the past few months, and booked again for their wedding anniversary. 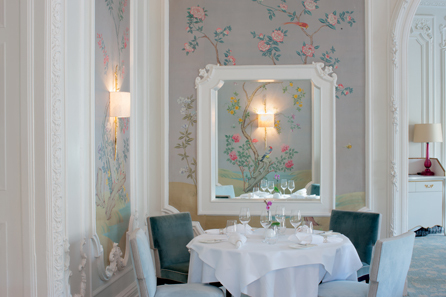 The Pompadour is certainly one of the top dining rooms in Edinburgh – romantic setting, exemplary service, divine cuisine. The attractive wood-panelled Galvin Brasserie de Luxe beside Peacock Alley offers a Prix Fixe menu and classic dishes: Oysters, L’Escargots, Lemon Sole, Coq au vin, Steak, Tart au Citron. A breakfast feast with a buffet counter as well as freshly prepared dishes to order, start the day with your favourites, from coffee and croissants to Eggs Benedict; Le Petit Dejeuner is also served in the Brasserie. Eat well, keep well. Workout in the Fitness centre with a swimming pool and for pampering relaxation visit the new signature Guerlain Spa, the first in the UK. Designed as a tranquil sanctuary to escape the city, experience specialist face and body treatments such as the exceptional Orchidée Impériale rejuvenating facial. The Caledonian Hotel is a model of timeless elegance. This glitzy, glamorous renaissance now shows off its grand Edwardian splendour with a touch of contemporary pizzazz, as this much beloved Grande Dame prepares to celebrate her 110th birthday. 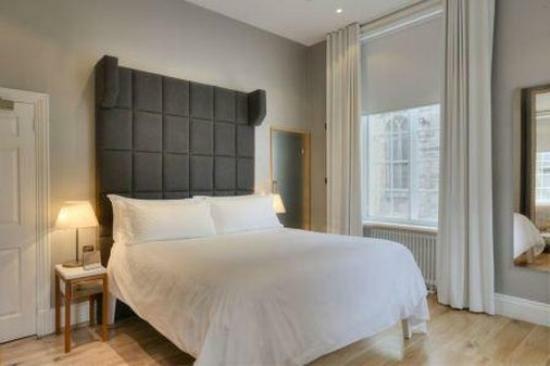 Just around the corner from Marble Arch tube station, this is the ideal place to stay if you wish to explore the heart of the Capital’s shopping and West End theatre districts. From the front door, wander along Oxford Street with its famous department stores and browse the designer boutiques of Bond Street. Originally opened in the 1920s, The Cumberland was the first London hotel to have direct-dial telephones and en-suite bathrooms. 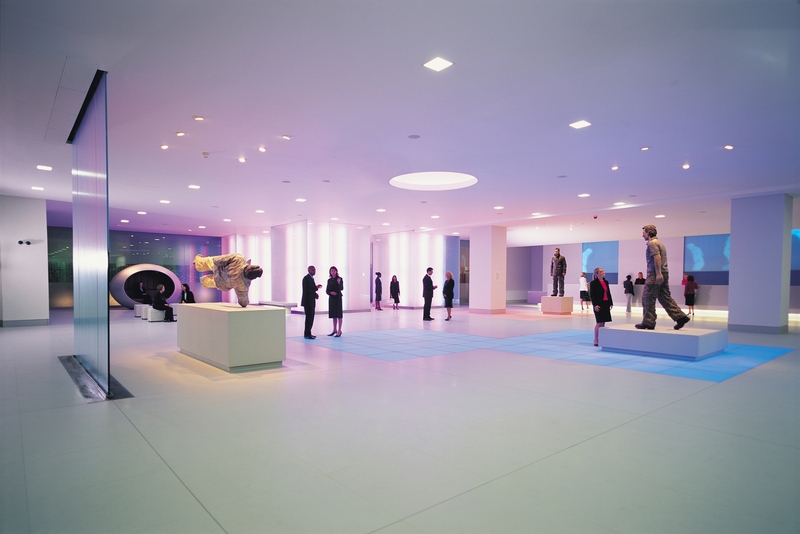 Modern interior design and facilities have kept pace through the century, starting with the entrance lobby with the Wow factor: the vast, minimalist art gallery space with two imposing, impressive sculptured figures. Leading off at each side is a choice of stylish, contemporary bars and restaurants. 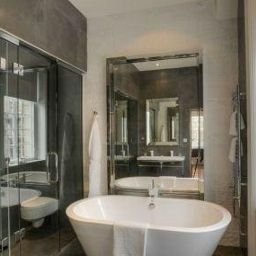 This palatial hotel has around 1,000 luxurious bedrooms, suites and apartments, including the Jimi Hendrix suite. Great Cumberland Place was the last known address of rock ‘n roll musician, Jimi Hendrix when he conducted his last ever interview with music journalist at the hotel, just days before his death in 1970. 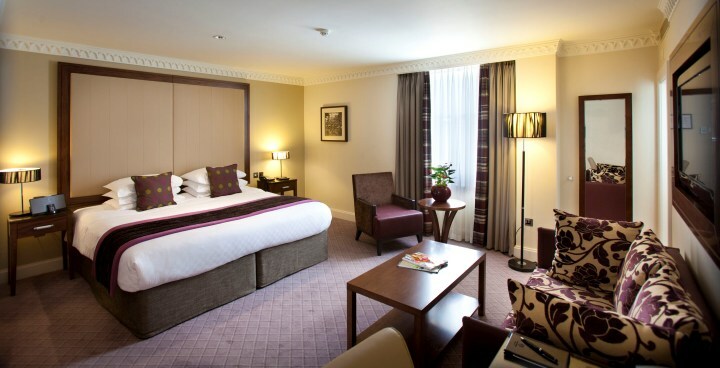 Bedrooms come in all shapes and sizes, with views of Oxford Street, Park Lane and over to Hyde Park. Be sure to reserve the style and situation of your preferred accommodation. The bedroom I was initially shown on the first floor was immediately above a busy intersection of buses, taxis and rush hour traffic, with no double glazing. I asked if I could possibly move to a room higher up or with a quieter outlook and I was offered a junior suite with lounge area, (sofa, armchair, 32” plasma TV), and deluxe bathroom (bath and power shower), bathrobe, slippers and soft towels. 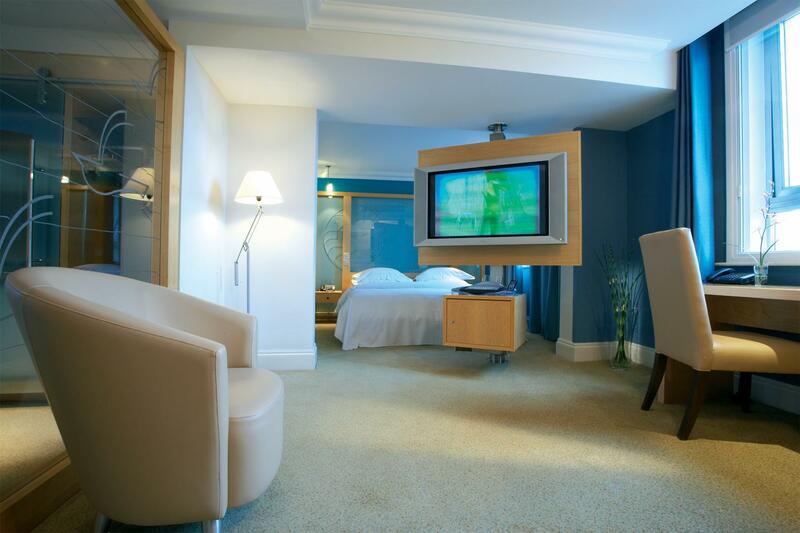 All rooms have tea and coffee tray, wi fi internet and free access to the cardiovascular gym. Guests in executive bedrooms and suites have complimentary use of the Guoman Club lounge with PCs, newspapers and magazines for a quiet retreat or business meeting. With a choice of Bars – the Patron, the cutting-edge Carbon nightclub and Momentus Champagne lounge bar – this is more like a Leisure Resort on an exotic island than a London city hotel. Over an aperitif in the low-lit Patron Bar – famous for Tequila cocktails and chill out sound track, I study the Brasserie menu of British favourites listed in simple shorthand manner – Beetroot, Macaroni, Mussels, Duck, Risotto. Moving through to the restaurant, I sit on a comfortable, long banquette, with tables well spaced out. To start I sample a generous portion of lightly sautéed Scallops on a bed of creamy risotto, followed by whole Lemon Sole served on the bone – (sufficient to share between two) with a side order of hand cut chips (naughty) and a green salad (healthy). Breakfast is served in the Market which took me a while to locate downstairs, along a corridor around the corner, hidden in the depths of the basement level. It’s a barn of a place to cater for hundreds of guests all wanting their coffee, toast and eggs at the same time. Be prepared to a self service experience with few waiters on duty to assist or clear tables, except for pouring mugs of tea and coffee from large flasks. While it’s more like McDonalds than a Hotel dining room, the range of British, American and Continental breakfast dishes is extraordinary. Allow time to wander around each buffet table and kitchen station to select your choice of fruit, cereals, pastries, omelettes, eggs, bacon and pancakes. Noisy and crowded it may be, but you can certainly enjoy a hearty breakfast to keep you going. See the website to check out special offers. Who could resist the Guoman Shopping package with a £ 50 Selfridges gift voucher thrown in. Also upgraded accommodation, Club Lounge and dining deals such as Pre-Theatre Dinners and Romantic Stays with bottle of champagne and breakfast in bed. You could not choose a better location than Charing Cross Hotel – and it’s a fact. Outside the door is a replica of the original Eleanor Cross the point from which road distances are measured to the centre of the London. The Grade II listed property was designed with a magnificent façade in French Renaissance style and opened on 15th May 1865, directly above the grand Station. Victorian railway companies were wise to build Station hotels as a way of “keeping passengers in their pocket.” Today, that ethos continues with direct access to train and tube transport right next door. Staying on the Strand, your are within walking distance of Theatreland, National Galleries, Soho, Covent Garden and Thames Embankment. The Guoman Collection has five distinctive hotels in London, as well as property in Shanghai, all part of a growing portfolio. Charing Cross Hotel was given a fabulous makeover a few years ago, preserving the original elegant features, grand staircase, rich wood and marble, now complemented with smart, sleek furnishings and facilities for the 21st century traveller. Unlike some global hotel brands, a unique, distinctive image is designed for each Guoman property. From the moment you step inside the compact, oval Reception lobby, this does not feel like a large, city centre hotel (239 bedrooms and suites). The ambience is welcoming, friendly, intimate, like a Boutique design hotel. A short corridor leads to the lift and within minutes I am in my Deluxe double bedroom with windows overlooking the rooftops and lanes behind the Strand and beyond is the Thames. Furnished in shades of soft cream, coffee and terracotta, the room is an impressive space with two armchairs, desk, plasma TV (Freeview), walk- in shower and bath, bathrobes and slippers, mini bar and hospitality tray. BT Openzone wifi is available at a charge. An umbrella in the wardrobe later proves useful. Bedding is exemplary: Egyptian cotton sheets, supersoft duvet and mattress comforter. The best aspect is the fact that I can turn off the AC overnight as it emits a loud hum. I can also open the window for fresh air. I feel relaxed and settle in. The Buckingham Wing is an Executive wing of 85 suites for business and leisure guests, offering extra special VIP luxuries, hospitality, internet access, Hypnos beds, dedicated check-in and concierge service. 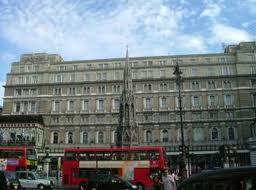 Visiting London on a business trip, the location is ideal, having arrived here quickly by tube from King’s Cross. A small business centre has the use of two PCs if you don’t bring your laptop. (A problem with logging on was quickly dealt with.) The exclusive Club Lounge on the ground floor is a quiet space to read a paper, sip a coffee or meet colleagues. Guests also have free unlimited access to the fitness gym. The Concierge was always at the front door greeting and meeting – and who could not be more helpful with requests and directions. The Terrace Restaurant on the first floor is a sun -filled Brasserie with high windows overlooking the Strand, with a café-bar lounge next door. The Terrace is a popular meeting place for guests and non residents for coffee, lunch, afternoon tea, pre-theatre suppers and dinner serving modern British and international cuisine. The ornate Betjeman banqueting hall and function suites are ideal for Corporate events, private dinners and weddings. The General Manager, Riddian Davies, (with a wide hotel and hospitality background in Fiji and South Africa) is young, enthusiastic and clearly passionate about creating an exciting, smart-casual lifestyle experience at Charing Cross. The emphasis is on a simple interior design to enhance relaxation and entice the senses. The use of light, sound and fragrances to create the atmosphere of an urban Spa is the underlying concept. This might sound like corporate marketing speak but after an overnight stay, the subtle manner in which atmosphere and accessories change between day and night is quite magical. Arriving back at 10pm after an evening out, the grand white hallway is lined with a river of warm, welcoming Tea lights. The softly lit Terrace Lounge Bar with its leather club chairs and buzzing with people sipping wine and cocktails, is friendly and inviting. Later, from the appetising room service menu, blending modern dishes with old favourites, I enjoy a tasty late night supper. The following morning I am amazed to see how the Terrace Bar and Restaurant have been simply transformed with draped white tablecloths into a Parisian-style Café for a leisurely breakfast. This is no ordinary London city centre hotel: Here the guest is treated with personal attention from arrival to departure without all the 5 star formality and fuss. Bedrooms offer space, home comforts and a hint of luxury for complete rest and relaxation. Attention is given to cool design, smart attitude, quiet ambience and fine hospitality. Just like the 19th century travellers arriving by train at Charing Cross station, the timeless, ever-fashionable Charing Cross Hotel is an oasis of calm in the true heart of London. A Destination hotel indeed.